Second-Year Medical Student Sam Beger Co-Owns Blue House Coffee. It’s no secret that the high demands of medical school can be challenging, but for Sam Beger, a medical student at the University of Arizona College of Medicine – Phoenix, the rigorous curriculum isn’t the only thing on his schedule. In addition to being a second-year medical student, Beger is co-owner of Blue House Coffee, a company he started with friends in 2012. Beger started Blue House with his roommate, Nicholas DiPastena, while an undergraduate at Arizona State University. Beger always thought that a coffee cart serving quality, quick iced coffee would be a great business at ASU. At the time, there were very few similar places in Tempe. By getting a small loan and retrofitting an old cargo bicycle, Beger and DiPastena opened Blue House Coffee on the corner of University Drive and College Avenue in Tempe. It was a small, one-cart operation with several employees that was open five days a week. Blue House is known for sourcing and roasting its own coffees. They source directly from farmers and have traveled to their coffee’s origins in Haiti, Uganda, Columbia, Costa Rica, and the Dominican Republic. After graduating from ASU, the Blue House team had full-time jobs that made it hard to keep up operations. They decided to take the cart and their coffee business to the Old Town Scottsdale Farmers Market. Shortly after, Blue House was awarded an Edson Entrepreneurial grant from ASU to establish relationships with coffee farmers and create more mobile coffee carts. Since then, they have purchased a bigger roaster and expanded their presence to three farmers markets: Old Town Scottsdale Farmers Market, Phoenix Public Market and the Uptown Farmers Market. Although it’s now rare to see Beger at the markets due to the demands of medical school, he has a “wonderful” group of co-owners and co-workers who help ease the burden. The group includes DiPastena, Ian Beger, Sean Magruder, Megan Husted, Spencer Simmons, Jordan Firman and Zach Zeigler. Beger has found a way to merge his two passions of medicine and coffee. 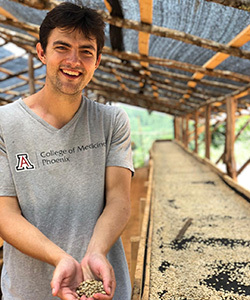 After seeing patients on a trip to the Dominican Republic as part of the College of Medicine’s Global Health program, Beger and his fellow classmates spent a few days in the mountains visiting coffee farms. Blue House participates in the Wellness Market on the Phoenix Biomedical Campus that takes place the second Tuesday of every month. He also has used his coffee as a method to raise awareness and donations for charity foundations like MinuteForALL, a foundation started by fellow second-year student and friend, Ben Conner.